This year, the National Diaper Bank Network is recognizing the week of September 10-17 as National Diaper Need Awareness Week, and local diaper banks across the country have asked their state and local officials to do the same. But more than merely declaring a week, we are acknowledging that the country is becoming more and more aware of the fact that diapers are a basic need for infants, toddlers, and those who suffer from incontinence, and that more people are willing to do something about it. We have come very far in bringing attention to diaper need in the eight years since I began this journey in 2004. When I started The Diaper Bank in New Haven, CT there were very few diaper banks in America, so I looked to the example of the Diaper Bank of Southern Arizona, the nation’s first diaper bank. That program began in 1994 when a small consulting firm in Tucson, Arizona held a diaper drive during the holiday season to assist a local crisis nursery. Encouraged by the enthusiastic response, and seeing the great need in their community, the firm made the December Diaper Drive an annual tradition, and within five years they were collecting 300,000 diapers each December, benefiting families at 30 local social service agencies. In 2000, the diaper drive effort was spun off into an independent non-profit organization, the Diaper Bank of Southern Arizona, which continues to provide desperately needed diapers to the people of southern Arizona. The Diaper Bank of Southern Arizona served as my inspiration in 2004 when I decided to start a diaper bank. Through my work with families in need New Haven, I learned that many of the hygiene products I took for granted, such as toilet paper, toothpaste, and diapers, were not available to people who had only food stamps to buy their groceries. The need for diapers, which are so critical for a baby’s health and comfort, was particularly acute. I started small, working out of my living room, but in a few years time, with the help of many others, what started as The New Haven Diaper Bank (now, The Diaper Bank) has grown into the nation’s largest diaper bank, distributing over 14 million diapers since its inception. The success of these diaper banks and others inspired similar efforts throughout the country. As awareness of the problem of diaper need grew, small but passionate groups of people responded by founding diaper banks in their communities as independent organizations, through their churches, and as part of the work of existing relief agencies. There are now over 150 diaper banks in America. Many of these organizations are quite small, but the difference they make is unmistakable. Still, however, the need for diapers far outstrips their ability to satisfy it. There are 5.7 million babies and toddlers living in low-income families who may struggle to provide diapers for their children. These children are at greater risk for severe diaper rash, dermatitis, and other health problems. For their families, a baby crying because of a wet diaper that cannot be changed adds to the stress on parents struggling to make ends meet. The purpose of Diaper Need Awareness Week is to recognize that there are people in the United States who struggle to provide clean, dry diapers for their children, and to celebrate the fact that there are organizations like diaper banks that can help people obtain the diapers they need. It is also to recognize the tremendous strides already made in raising awareness of the need. I recently checked the number of mentions of “diaper banks” on webpages using Google, and the amount of web activity for diaper banks by year has increased dramatically. In 2004, when I first started my diaper bank, there were only 94 mentions of “diaper bank” on webpages for the whole year. In the first eight months of this year alone, that number has increased nearly two orders of magnitude to 7800. I expect that by the end of Diaper Need Awareness Week, that number will increase even more. We at NDBN are starting the week with a bang, holding our first ever Diaper Bank Conference in Washington, DC, where forty diaper bank leaders will gather to learn more about how to make their efforts go farther. We hope by holding the conference in Washington, that we can demonstrate that grassroots charitable action can effect change in our country, and address a need experienced in places as diverse as Chattanooga, Tennessee and Santa Monica, California, and Lewisville, North Carolina and Seattle, Washington. Why should this matter to you? Because this group of people are working together to change their communities, their states and their country by coming together to support people in need. The more activities there are around Diaper Need Awareness Week the more people will learn about the significance of this issue. Please consider holding a diaper drive, hosting an event, donating to you local diaper bank or donating to the National Diaper Bank Network. — originally published in the Huffington Post, August 22, 2012.
. . . are surprisingly hard to unload, particularly if the diapers were on pallets that were loaded on the truck sideways. I can say this now from first hand experience, since I participated in my first truck unloading last week, as a board member of The Diaper Bank in North Haven, CT. The Diaper Bank is serving as a hub for our east coast distribution of diapers this month, and received two truckloads of diapers, each containing 268,240 diapers. 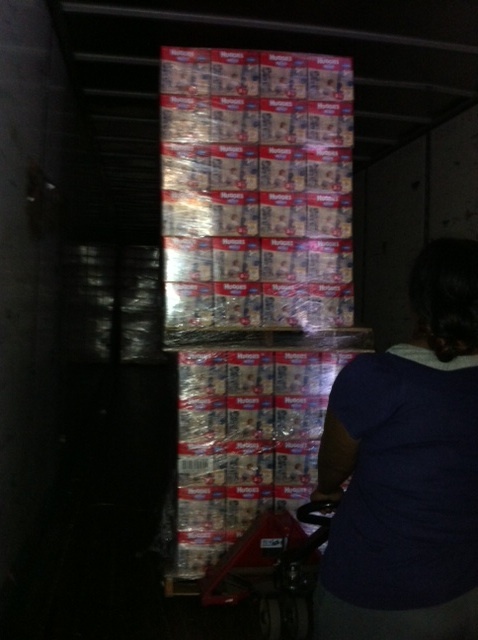 The diapers in this truckload came on 30 pallets, or more precisely, what seemed to me to be 30 double decker pallets, which created a high and not entirely stable stack of diapers held together with shrink wrap. Sort of. When the pallet jack was operated by less experienced hands, the diapers could (and did) topple over, creating a cascade of boxes in the middle of the warehouse. Have I mentioned this was my first actual experience with a truck full of diapers? I have been on a board of The Diaper Bank for nearly three years, and part of my current work duties is to help orchestrate the flow of diapers across the country (although I admittedly leave most of the orchestration to the very capable and charming Chris Blake, senior vice president of our distribution partner, Kids in Distressed Situations). 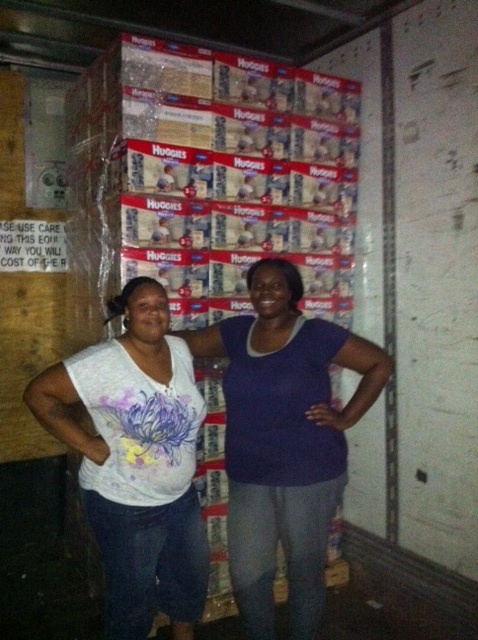 But I had never before seen what a truck load of diapers looks like. Now I have. It is a [expletive deleted] lot of diapers. Having seen how much space 268,240 diapers take, I now have a better appreciation for how many diapers that really is. But I am also even more amazed when I realize how little that number will do to help the diaper need problem facing our nation. Without getting into questions about sizes and such, and assuming an average of 50 diaper changes a week, 268,240 diapers would provide a week’s worth of diaper changes for 5,364 children, or a year’s worth of changes for about 104 children. The Diaper Bank in North Haven helps 4000 families monthly. Even if these diapers were going to stay in North Haven, they would be a great help, but not enough. These diapers, however, are destined not only for The Diaper Bank, but will also be distributed to other diaper banks in the Northeast. And there are still other trucks filled with diapers going out to other distribution points throughout the country (another shout out to Chris Blake–THANK YOU). As I mentioned in an earlier blog post, “So How Many Diapers Do We Need?,” we need billions of diapers to help the 5.7 million infants and toddlers living in poor and low-income families. Every little bit helps–every package of diapers you bring to a local diaper bank helps a family in need, and every dollar you give can be used to buy diapers. Help us close the diaper gap. Does your state charge sales tax on diapers? We think about basic needs and their availability to people struggling to make ends meet. But there is not a universal definition of what constitutes a basic need, or agreement on whether such needs should be taxed. That is apparent when considering the sales tax policies of each state. For the most part, each state has its own approach to sales tax–whether there is one, what rate it will be, and what it applies to. Some states, like Alaska, Delaware, New Hampshire, Montana, and Oregon, opt not to have a sales tax at all. (Hawaii does not officially have a sales tax, but it has an excise tax which business can pass on to the consumer, so it is essentially a sales tax.) Many states exempt certain basic necessities from tax, but each state has its own approach to what is considered a basic necessity. For example, several states exempt food, but they often have individual definitions of what counts as food. Likewise, some state exempt medical supplies, which for some states include all diapers (as in Massachusetts), adult diapers and incontinence supplies only (as in Connecticut, Maryland, and Nebraska), and in other states explicitly do not include diapers. In other states, diapers are not taxed because they fall under a general exemption for clothing (as in Minnesota, New Jersey, New York, Pennsylvania, and Vermont). Still other states have annual sales tax holidays on certain items (generally during the first week of August or so as families are doing “back to school” shopping), often including diapers. 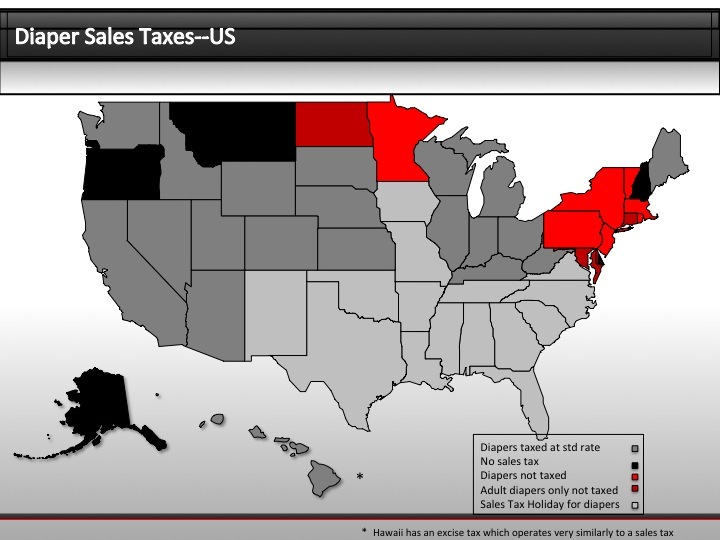 We have a Sales Tax Survey identifying the specific sales tax policies as they relate to diapers for each state . Thanks to the Yale Law School Arthur Liman Research Project Students, Matthew Smith, Irina Vaynerman, and Tara Rice for their legal research assistance. You can find more interesting research related to diaper need on our website here.